The Best Vietnamese Food blogs from thousands of top Vietnamese Food blogs in our index using search and social metrics. Data will be refreshed once a week. Also check out Top Vietnamese Food Youtube Channels list for Top videos on Vietnamese Food. Saigon, Vietnam About Blog Saigon’s guide to restaurants, street food, news, bars, culture, events, history, activities, things to do, music & nightlife. Facebook fans 47,643. Twitter followers 5,465. About Blog This channel helps you cook Vietnamese Food in the easiest, fastest and most authentic way. Facebook fans 30,522. Twitter followers 1,134. About Blog Cookbook author Andrea Nguyen's site dedicated to Vietnamese recipes, Vietnamese food, Asian ingredients, Asian cooking tips, Little Saigon communities, and other Asian recipes and food cultures all over the world. Facebook fans 68,185. Twitter followers 9,545. About Blog Follow Good food for simple and easy Vietnamese food, recipes and dishes. Zurich, Switzerland About Blog A food blog featuring easy and delicious Vietnamese dishes and recipes, travel tips and beautiful food photography. Facebook fans 11,405. Twitter followers 2,542. United States About Blog Vietnamese Food Recipes-Asian and American Comfort Food Recipes. We teach you step-by-step how to cook Vietnamese Food and Asian Food Recipes and make a great meal for your self or family. Facebook fans 1,730. Twitter followers 11. United States About Blog Van's Kitchen features detailed step-by-step recipes of authentic Vietnamese food, with occasional forays into baking and other ethnic cuisine. If you enjoy cooking at home, you're in the right place! Facebook fans 5,271. Twitter followers n/a. Paris About Blog The taste of Vietnam. Recipes and Vietnamese cooking classes. Facebook fans 5,809. Twitter followers 948. Ho Chi Minh City About Blog Oi Vietnam in its Wine & Dine section features restaurant reviews, traditional as well as local Vietnamese food, street food and more. Facebook fans 14,316. Twitter followers 1,098. Vietnam About Blog Foody.vn Youtube video channel is Vietnam's leading online destinations for traditional Veitnamese cuisine. Facebook fans 3,365,847. Twitter followers n/a. United States About Blog Hi, my name is Beth Pham and I love to cook, my passion for cooking is endless. I cook authentic Vietnamese food and other Western dishes. I like to create an easy way to bring great food into your kitchen which is healthy and delicious. United States About Blog Here you will find delicious and simple authentic Vietnamese food recipes from all regions by Mai Lynda. United States About Blog We're a Vietnamese vegan cooking channe. We hope to spread the love of vegan food in the form of Vietnamese cuisine. Facebook fans 316. Twitter followers 36. About Blog Vietnamese food recipe ,cooking is one of my passion.Without the passion of cooking, I could not create those wonderful recipes that I have been doing.I try to use all the natural ingredient as much as I can to avoid health damage in the long run. About Blog This channel is a cooking tutorial channel that is about the diversity and the benefits of Vietnamese cuisine, and to guide how to cook a good Vietnamese dish. About Blog Hi everyone! I'm Cathy Ha and I love showing you how to make delicious Vietnamese and other delicious dishes that are easy to make at home for our family and friends. I bring together easy recipes and cooking techniques that will make you the star of your kitchen. Toronto, Ontario About Blog The Viet Vegan is a personal food blog by Lisa Le. I shares veganized comfort food recipes, personal essays, and self-reflections about veganism, nerd culture, feminism, and more. Facebook fans 8,429. Twitter followers 1,846. Sunny Southern California About Blog Hi! I'm a recipe developer & blogger. I take traditional Vietnamese & Asian recipes & give them a modern twist! I share recipes, how-to videos, tips & shortcuts. Facebook fans 4,613. Twitter followers 99. Seattle About Blog Ba Bar is a Vietnamese Restaurant and Craft Cocktail Bar in Seattle. Facebook fans 216. Twitter followers 1,870. California, USA About Blog Authentic Vietnamese home cooking made simple. Explore Vietnamese cuisine through recipes handed down by many generations of Grandmas and loved ones. Facebook fans 137. Twitter followers 2. 22. The Spices of Life . . .
Ho Chi Minh City About Blog Hai and I live and eat here in Saigon everyday! We search out the best Saigon street food and small hidden restaurants and share them with you on EATING SAIGON! Facebook fans 3,404. Twitter followers 275. Indiana About Blog My blog serve as a way for me to preserve my Vietnamese heritage and traditions through food, cooking, and family. It's a journey full of sweet and sour moments, and I love every bit of it! Facebook fans 1,986. Twitter followers 26. Paris, France About Blog Have you ever tasted these little Saigon cinnamon Energy Balls? Very easy to make, with raw ingredients and full of vitamins to boost you throughout the day, here’s the recipe of Chef and Insta-blogger Karine from Coupsdefood! Facebook fans 908. Twitter followers 18. Close to a Big Green Egg About Blog Hi, my name is Adam and I love to cook. Mainly bread, Vietnamese food and anything that can be conceived on a Big Green Egg. Facebook fans 94. Twitter followers 32. Facebook fans 930. Twitter followers 21. Vietnam About Blog This blog carries my food exploring journey and it is dedicated to everyone who also has unlimited love with food and travel, especially in Hanoi, and Vietnam. Facebook fans 297. Twitter followers 299. Regina SK About Blog I am Elizabeth, a Vietnamese-Canadian, born and raised in Regina. Based on our backgrounds, meals in our house are an eclectic mix of traditional Vietnamese food and Canadian comfort food. Facebook fans 139. Twitter followers 453. About Blog Hi we are Scruff and Steph! Thanks for visiting our blog! Here you’ll find our family’s favourite food, including traditional Vietnamese dishes and food for large gatherings, all using affordable ingredients. About Blog Phi sharing Vietnamese Food Recipes on her blog Boriville. Facebook fans 1,187. Twitter followers 51. Facebook fans n/a. Twitter followers 3,215. Da Nang - Vietnam About Blog With Da Nang Food Tour, you can enjoy authentic Da Nang food with a local expat guide. Discover what to eat and how to eat it in small eateries down hidden alleys packed with locals. Facebook fans 1,137. Twitter followers 82. SF Bay Area About Blog Follow this channel for Vietnamese cuisine and more by Huong. Facebook fans 18,954. Twitter followers 91. About Blog Share all my cooking techniques and recipes of authentic Vietnamese food and other Ethics dishes. I like to create an easy way to help you put healthy, delicious foods on the table and encourage health eating habits. Cooking and eating are the best ways to serve up success. 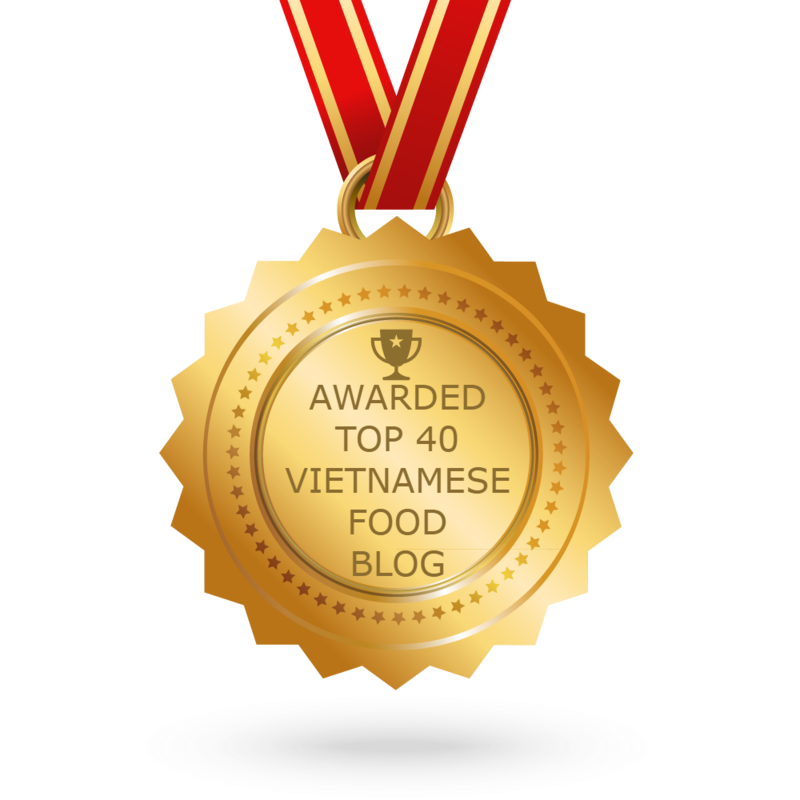 CONGRATULATIONS to every blogger that has made this Top Vietnamese Food Blogs list! This is the most comprehensive list of best Vietnamese Food blogs on the internet and I’m honoured to have you as part of this! I personally give you a high-five and want to thank you for your contribution to this world.